At first, Francesco Munzi’s “Black Souls” feels undercooked. Its familiar tale of a family torn apart by crime owes a great deal to narratives we already know and its deliberate pace, with its rolling countryside and strings-heavy score, feels too lethargic. And yet this is one of those pieces that rewards viewers willing to invest in it as the deliberate pace pays off with lived-in characters and a surprisingly emotional undercurrent of near-Greek tragedy. Even those shots of the countryside begin to feel colder and more inescapable as the score becomes more dissonant and disruptive. 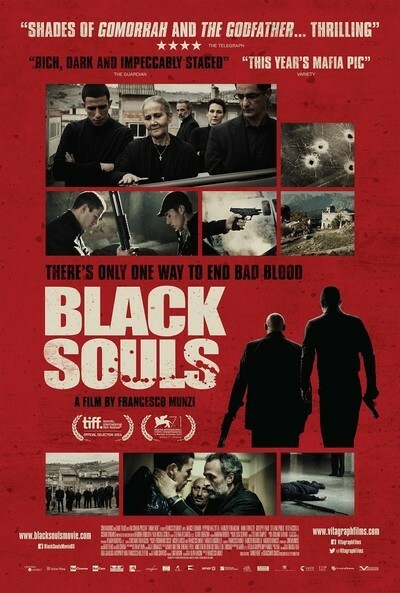 “Black Souls” isn’t quite the great film the international cinema buzz machine has touted it to be in some circles, but it is a very good one, the kind that ends with such gravity that you feel its weight for a while after. “Black Souls” starts as a piece about generational differences within a crime family. The idea that one generation of mobsters aren’t doing it “right” like the previous one is as old as the mob itself. Hell, even Tony Soprano had to deal with Jackie Jr.’s nonsense. There are two crimes early, one by an older generation for sustenance/need, as they steal animals to cook, and one by a younger generation that is pure vengeful vandalism. It’s clearly symbolic of a generational rift that can only lead to tragedy, but the first act of “Black Souls” barely registers as a mob movie. Its purpose can be hard to discern for the first hour as there are more meetings, family discussions, and scenes of cooking than scenes of violence. What Munzi’s approach allows for is characters that feel lived-in and genuine, he allows them to ground themselves before unleashing a narrative upon them. “Black Souls” is about three brothers in Calabria, in Southern Italy. Based on a true story, it details the divergent lives of Luigi (Marco Leonardi), Rocco (Peppino Mazzotta) and Luciano Cabrone (Fabrizio Ferracane). Luigi and Rocco are involved in the family business of drug-trafficking on a very high scale, but Luciano has remained in the mountains of Calabria, content with a life of herding goats and finding simple happiness. His son Leo (Giuseppe Fumo) has no respect for dad’s domesticity, naturally drawn to the flash and sizzle of his uncles. When he goes to visit Luigi and Rocco, he is drawn further into the criminal underworld, against his father’s wishes. Can the eldest brother of criminal power figures really stay out of their world altogether? Especially when his son seems inclined to follow the path that involves righteous vengeance instead of goat-herding? Performances here are uniformly strong, especially Leonardi, who captures the kind of charismatic uncle to whom any young man would be drawn, and Ferracane, who carries the weight of the inevitable in his eyes. It’s almost as if Luciano knows tragedy is coming and that there is absolutely nothing he can do about it. They are merely animals being herded in one direction with the illusion of choice as to where life leads them. Munzi’s film is a mob movie steeped in misery. It is often barely lit, usually naturally, and it just feels so cold that one can nearly see the breath of its characters. And yet there’s still deep emotion here. It’s just smothered by the antiquated tragedy of mob life. Crime has impacted these people so deeply that it has blackened their souls, even those who have reached out to try to live a normal life. “Black Souls” moves along so deliberately that I wasn’t sure if it would end in images of isolation or violence. In this dark world, the two are intertwined.